The North Cedar River Bridge is used to transport aircraft from Boeing’s production facility to the Renton Municipal airport. It replaces a 70 year old structure that was determined to be structurally and seismically deficient. 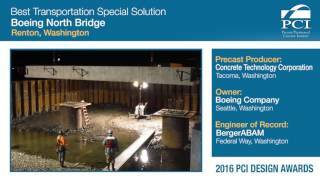 The design team earned the 2016 PCI design award for “Best Special Solution” for utilization of an Accelerated Bridge Construction (ABC). The use of prefabricated bridge components was an ideal solution for a site with significant schedule challenges due to airport traffic, manufacturing operations and in-water work restrictions. The overall schedule was reduced by six weeks utilizing ABC methods. The bridge superstructure consists of full-depth, transverse precast decks supported by longitudinal steel girders. The precast decks were concentrically prestressed. All of the precast decks were then post-tensioned together in the longitudinal direction of the bridge. Deck-to-deck and deck-to-girder connections were completed with field grouting.